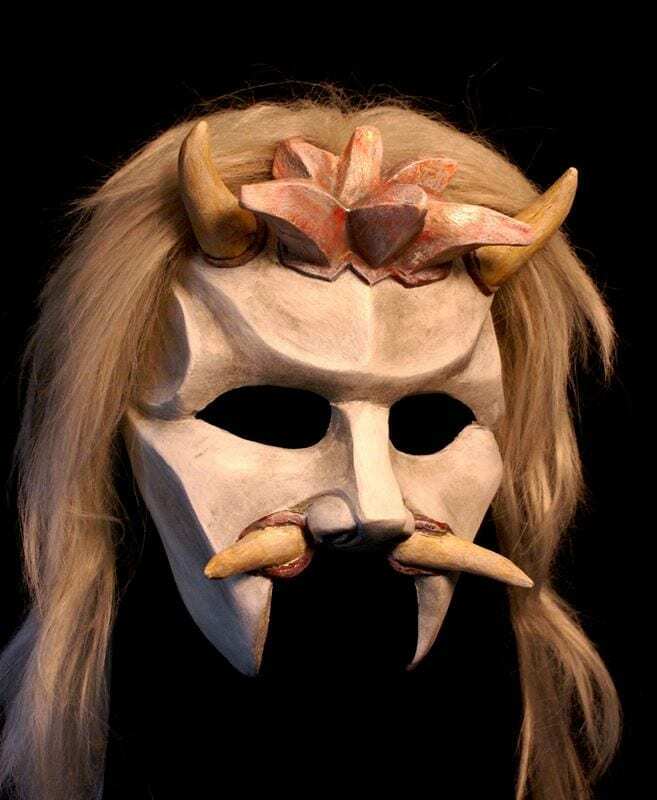 The Hades Mask was created for Director Rusty Cucio in 2012 for New Musical version of Lysistrata with music by Tony Award winning Galt MacDermot and book and lyrics by Matty Selman. The world premier was on Long Island. This character half mask is great example of the a custom mask made by mask maker Jonathan Becker. The sculpture was made out of water base clay, cast in plaster and then the neoprene mask was made in the mold of the mask. A thermoplastic (veraform) wig form is sewn to the mask and then the wig is attached to the form and the mask itself. This way the whole piece can be easily put on and taken without having to restyle the wig each time. Lysistrata is of course a comedy written by Aristophanes. The play is the story of the women of Athens extraordinary effort to end the Peloponnesian war. The play is a commentary of the working of sexual relations in patriarchy. The Musical by Galt and Selman was called Goddess Wheel.